For this week’s tutorial, let’s sketch a flamingo bird! 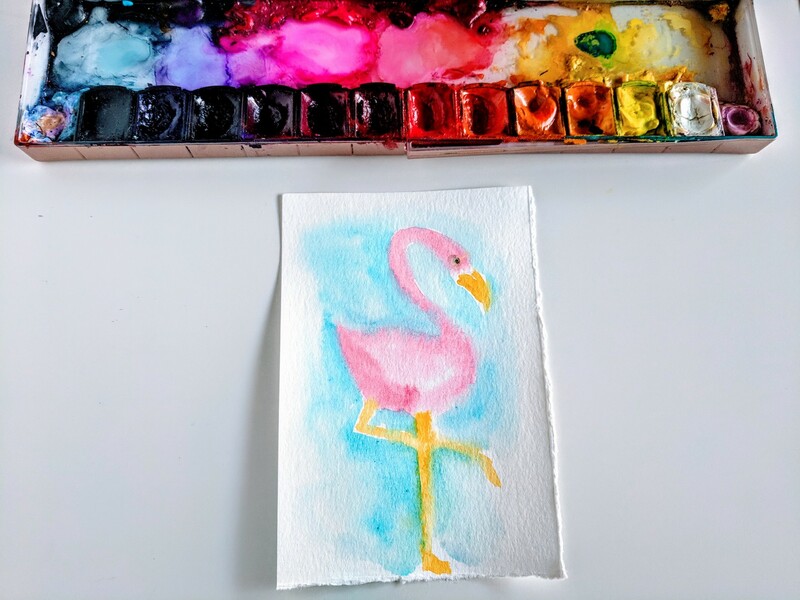 The watercolor flamingo sketch just so happens to also match the similar color scheme I’ve been using in several past tutorials. And it’s still very summery and fun. This tutorial was inspired by the Creative Bug monthly challenge with August Wren (Jennifer Orkin Lewis). The one I did for the challenge was in gouache, and I thought it would be fun to try painting a watercolor flamingo with the wet-on-wet technique. Decorate your sketchbook or turn this into a ‘Thank You’ or ‘Just Wanna Say Hi’ card and send to your best friend. Step 2. Sketch the neck of the flamingo. Start sketching the shape of the bird with pink watercolor. The neck of the flamingo bird will resemble a hook shape. You can also pretend it is the shape of number 2 but backwards. To sketch the body of the bird, sketch an oval-like shape with a little tail on the left-hand side. 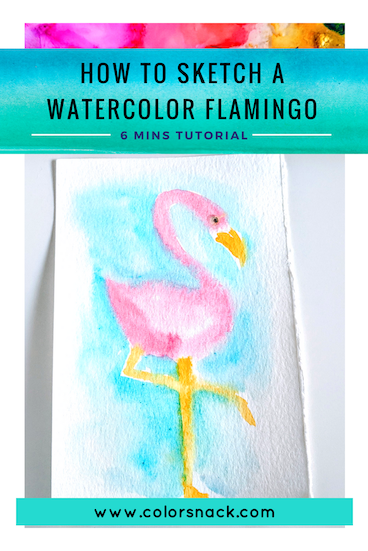 I used the pastel red from the Prima Watercolors to add a little feather lines on the body of the flamingo. Sketch the legs as two lines, almost perpendicular, crossing each other. Fill in the background with a blue shade of watercolor. I am using the blue pastel here and really love the contrast between the blue water and the pink flamingo.